Journals are threatened by open access, free citation metrics and web 3.0. 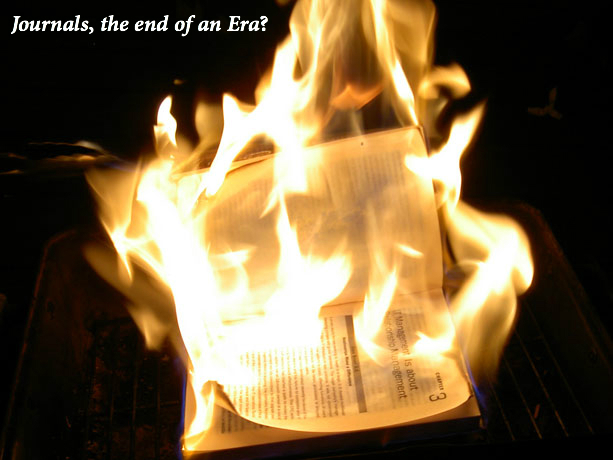 Publishing houses, universities and governments are uniting in a holy alliance intended to exorcise this changes, trying to reinforce the current indexing journal system. It is high time that scholars should openly, in the face of the whole world, share their views, their aims, their tendencies, and meet this challenges with a manifesto. The history of research quality assessment is the history of scholarly struggles. 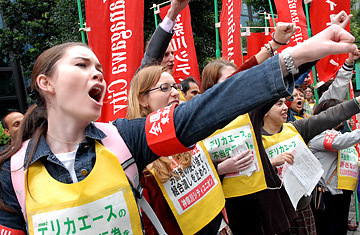 In academia, the working class –researchers and professors– are fighting in the class struggle against the owners of the means of production in academia, the journals, and that the current class struggle could end either with revolution that restructure the system, or common ruin of the contending scholarly classes. There is a hidden civil war between scholars: researchers/professors against editors of journals. Editors have the power to publish, the power to make us professors progress in our careers. The accumulation of power in journal hands, the formation of first class indexed publications, and the competition amongst the academics creates pressure on our daily lives. 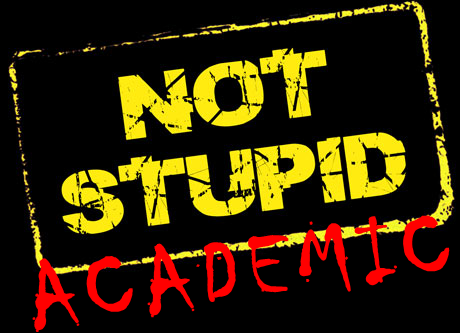 We are just professors and researchers who want to publish in journals to improve as academics and find tenure. We do not hate journal editors, we are not afraid of you. We don’t even know you. We wish you no harm. On the contrary, we want to be your friends and make your editor life easier. We love journals. We need to understand you. To all professors/researchers who feel the same, share this message and help it reach journal editors. Montserrat Guillén was born in Barcelona in 1964. 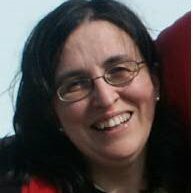 She received a Master of Science in Mathematics and Mathematical Statistics in 1987 and a PhD in Economics from University of Barcelona in 1992. She got an MSc in Data Analysis from the University of Essex (United Kingdom). She was Visiting Research faculty at the University of Texas at Austin (USA) in 1994. Montserrat also holds a Visiting Professor position at the University of Paris II, where she teaches Insurance Econometrics. Since April, 2001 she is chair professor of the Department of Econometrics at the University of Barcelona. Montserrat was awarded the ICREA Academia distinction. Her research focuses on actuarial statistics and quantitative risk management. She has published many scientific articles, contributions to book chapters and books on insurance and actuarial science. She is an Associate Editor for the Journal of Risk and Insurance – the official journal of the American Risk and Insurance Association, a senior editor of Astin Bulletin – the official journal of the International Actuarial Association, and chief editor of SORT – Statistics and Operations Research Transactions. Montserrat was awarded by the Casualty Actuarial Society and received the International Insurance Prize. She is a highly cited academic in the field of risk management and insurance. She was elected President of the European Group of Risk and Insurance Economists, the Geneva Association, in 2011. She serves in many scientific boards, international programs and steering committees and conducts R&D joint programs with many companies. Gaudeamus. 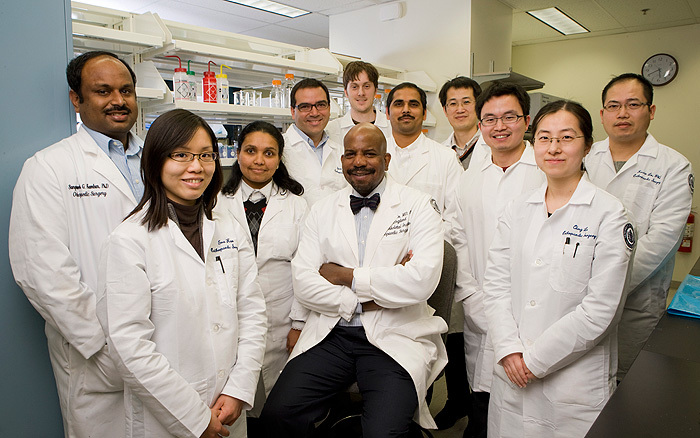 How do you select your research projects, or do they select you? G. You usually collaborate with international scholars, it should not be easy to coordinate and organize research, is there any aspect worth mentioning that could help us researchers regarding international projects? MG. There must be a leader. The leader must be open-minded, active, motivating and has to set up short term and long-term goals for the team. Everyone involved must know his/her role in the project and why his/her contribution is important to the whole group. MG. Both. Even if a lecturer is very good, good teaching is even better with good research. I find that usually we forget that research advances have to be introduced in the syllabuses and this is essential for high quality education. Research also benefits from teaching, because communicating research results needs many of the skill that is developed when teaching. MG. I really enjoy the instants when a new result is obtained. There are some seconds of doubt, and then an explosion of joy when the result is confirmed. Sometime this happens when working on my own and sometimes this is shared with colleagues. If I obtain a results and no colleague is next to me, I would immediately tell it with my colleagues. G. Once you have a draft research document, what key issues should be taken into account until it is published? MG. It does because searching information is much easier than it used to be. Reading the essential papers is important when there are so many out there. G. How do you choose the journals where to publish? Or if you prefer, what are you looking for in a journal? MG. I would recommend spending a lot of time on how to explain the research result. Some very good contributions remain get no notoriety due to a poor presentation. Correctness, clarity and motivation are crucial for the success of a paper. Priyanka Gilani is the Managing Editor of Indian Journal of Marketing, Indian Journal of Finance, Prabandhan: Indian Journal of Management and Arthshastra: Indian Journal of Economics & Research, four double blind peer reviewed monthly journals. An alumnus of the University of Delhi, Priyanka has proven to be a dedicated and skilled Managing Editor of four major business research journals. With more than six years of experience in Editorial Development, Editorial Project Management, Editorial Consulting, Editorial Production, Content Writing and Content Management, Priyanka has been successfully handling the myriad details required to produce the monthly editions of the four journals. With a subscriber base that is unparalleled by any other Journal in India, they are the leading Journals of Business Management in India, with a pan-India presence and a discernible International subscriber and readership base. Priyanka Gilani: Our target audience are: Professors/Lecturers/Academicians in various capacities and levels as well as Students/Research Scholars with research interests in Marketing, Finance, Management, and Economics; industry experts, Business Managers, Consultants, Policymakers and Practitioners of Marketing, Finance, Management, and Economics disciplines; also, our titles are widely referred for classroom discussion across India. G: How difficult is to find content to satisfy your readers? And what do you do to find it? PG: Since we have been in this field since the last four decades, and due to our sound Editorial Policies, we have a very healthy manuscript submission rate. Our titles have a wide audience and are quite popular; hence, our Journals are an obvious choice for academicians and scholars associated with the field of Business Management. Over the years, we have painstakingly established, cultivated, and maintained a good reputation that has been vital in attracting authors. Only 15% of the manuscripts submitted to our titles are accepted for publication. In order to satisfy our readers, we publish insightful research of the highest quality, and the subject scope reflects and keeps pace with the evolving research activities in the 21st century. G: What characteristics should have a paper to be published in your journals? Have quality references ( both in-text and cited references). 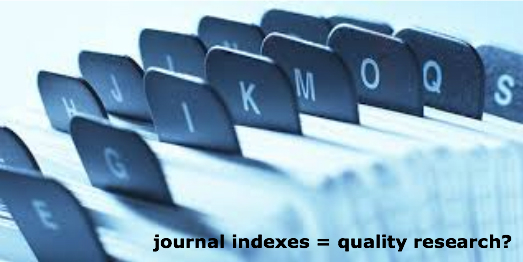 G: What is the role of indexation for journals in general? Do you feel any kind of pressure as Managing Editor about indexation? PG: Indexing of Journals is of paramount importance as most of the authors choose to publish in a Journal only after seeing where the Journal is indexed/abstracted as they get extra credits for a paper published in an indexed Journal. For various databases, the decision to include a Journal is based on several factors – the most important being Scientific Quality, Editorial Value, Technical Quality, International Availability, and Regularity with which a Journal is published. Furthermore, receiving a rating from a ranking system further cements the position of a Journal as this system provides a multi-parameter analysis of scientific output, research potential, and is an evaluation of a Journal’s quality. Indian Journal of Marketing, Indian Journal of Finance, Prabandhan : Indian Journal of Management are indexed in the Cabell’s Directory of Publishing Opportunities, USA; Ulrich’s International Periodicals Directory, USA; Index Copernicus Journals Master List, Index Copernicus International, Poland; Indian Science Abstracts (ISA-NISCAIR), Journal of Economic Literature (JEL), USA ; and EconLit, USA. Recently, Indian Journal of Marketing and Indian Journal of Finance have been accepted for inclusion in Elsevier’s SciVerse Scopus after undergoing a rigorous evaluation procedure. I think Scopus covers just one title of Business Management from India, and we are extremely proud to have made it to the list. In addition, our titles have been awarded the NAAS Rating by National Academy of Agricultural Sciences, which is a Government of India institution. So, yes, in India, Indexing is very important for a Journal. Having said this, I feel that search engines like Google Scholar with the Google Scholar Metrics will give tough competition to indexing databases in the future. G: What do you think are the main drivers of change in journal publishing in India? PG: Research in Business Management is still at a nascent stage in India. Scholarly journals indexed in good databases, publishing pioneering research whose results can be fed into management practice and public policy making that is specific to Indian sub-cultures and markets will be the main drivers of change in Journal publishing in India. Social Media (Web 2) will offer the potential to enhance informal and scholarly communication. Most importantly, the policies of the Government of India will have a great impact on Journal publishing in India. G: What are the main problems a Managing Editor of several international journals faces? PG: Running four peer-reviewed Journals has its own set of challenges. Producing monthly editions of our titles is indeed quite challenging as we have to work with extremely tight deadlines. We have to produce an Issue within the shortest possible time, without compromising on the quality of the content. Since our titles are produced in the print form, we have to make sure that our titles are printed as per the schedule to be dispatched on time. In the midst of producing regular issues, I also have to serve as a liaison between the reviewers and the authors to evince high quality and timely reviews, and then communicate with the authors regarding the status of their submission. In addition, I correspond with authors regarding my suggestions to improve a paper, suggest changes as per our editorial requirements, respond to routine correspondence and inquiries related to our titles, and contribute to Editorial meetings. I have a jam-packed schedule, but I truly enjoy my work as each day is a learning experience. G: Finally, what advice would you give to scholars when submitting papers to your journals? PG: The authors should read the Guidelines for Authors carefully regarding the instructions pertaining to manuscript specifications, style guide, and the formalities associated with submission and publication of a paper. Ensure that citations are complete in all respects (both in-text and cited references). Don’t make multiple submissions of the same paper. Since all communication is through email, please check your email regularly, and in case of any queries regarding a paper, a submission, or anything regarding the Journal, get in touch with the editor directly to clarify the queries rather than harbouring pre-conceived notions. After publication, include your papers in Google Scholar to publicize your paper and also to increase citations.